San Francisco doesn't have to be as expensive as everyone thinks. There are countless free and cheap events, shows, and deals in San Francisco every day. You just have to know where to look. Guess what? You’ve found it. We scour San Francisco for the best budget-friendly events, deals, and tips, and post our favorites every day. We make sure you have the best trip possible in San Francisco - without breaking the bank. This site is filled with practical tips and budget travel deals throughout San Francisco. Travellers staying at any hostel can join us at the best cheap SF events and activities. Ask Jessica SF budget travel questions in our free FB group and get personalized advice. Oakland A's vs. Texas Rangers Baseball Game: Pick Your Price! Get Your Groove on at a Concert in a Bike Shop in Emeryville! Make New Friends and Win Prizes at the Legendary SF Beer Olympics! Nobody likes traveling with a wet towel. Use ours instead. 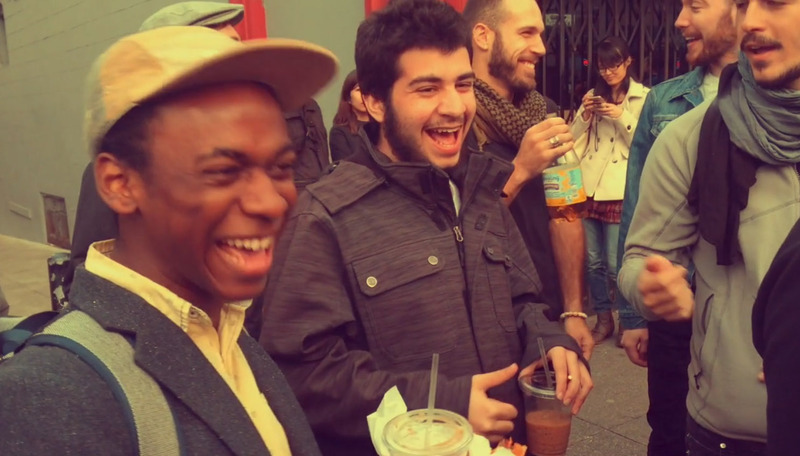 If you are a friendly and social backpacker we're the best San Francisco hostel for you. Make a booking now so we can welcome you into our travelers community. Contact us any way you want, but do let us know about your trip to San Francisco. We'd love to hear about your trip. We look forward to meeting you. There are many ways to get to our hostel. Each option will depend on your budget and time you want to spend traveling. We have listed all the options below with more details if you click on them. Bear in mind that the airport is located 14 miles south of San Francisco, so once your flight arrives you'll still have the last little leg of your journey to complete. The San Francisco Airport is modern and easy to navigate, so you shouldn't have any problems getting where you need to be. It's served by a variety of forms of public transportation so it's up to you (and your budget!) how you'd like to get to the city - and to us! Perhaps the easiest way is to take the BART (Bay Area Rapid Transit) subway directly from the airport. You can also hire a shared door to door shuttle service. The best way to get to us from the airport is to take BART (Bay Area Rapid Transit) directly from the airport.BART is a rapid transit system which connects San Francisco with the rest of the Bay Area, and a ticket from SFO to us will cost $8.65. Go to the Airtrain (up escalator) and take the Red line from any terminal to the airport BART station. Take BART to San Francisco (Pittsburg/Baypoint, Richmond, or Fremont bound trains will all stop in San Francisco) and get off at Montgomery Street Station. As you walk up to station level with Peet's Coffee & Tea straight ahead of you, take the exit to street level on your left. If you are coming to San Francisco, don't forget to check arrival options at the Oakland International Airport. In some ways, it's easier to get to San Francisco from the Oakland Airport than from the San Francisco Airport. NowThe main Greyhound terminal is at 200 Folsom St, not far from the hostel. Head south-west on Folsom and turn right onto Beale Street. Follow Beale all the way up until you hit Pine, when Beale turns into Davis St. If you follow Davis up, you'll turn left onto Sacramento after a couple of blocks. We're four blocks along, on the right hand side - you'll see our blue security gate. If you have a lot of luggage or just feel too tired to walk, you can catch the bus. Head up Folsom and turn right onto Main Street. A couple of blocks up, at Main and Howard, you can catch the 41. Get off at Sansome and Sacramento. We're two blocks up Sacramento, building number 680. Walking from the CalTrain station takes about 30 minutes, if you are up for it. To do this, exit the CalTrain station and turn left to Townsend Street and then turn right. Walk one block East to 3rd Street and turn left. Continue walking on 3rd Street. At Market Street, the street you are walking on will change to Kearny Street. Continue walking on Kearny Street 6 blocks to Sacramento Street. Turn right on Sacramento Street. Our building is on the left. Look carefully for building number 680. The Amtrak train station is in Emeryville, which is located across the bay from San Francisco. Fortunately, when you buy an Amtrak ticket to San Francisco an Amtrak Thruway Bus will meet you at the train station to take you across the Bay Bridge and the rest of the way to San Francisco. 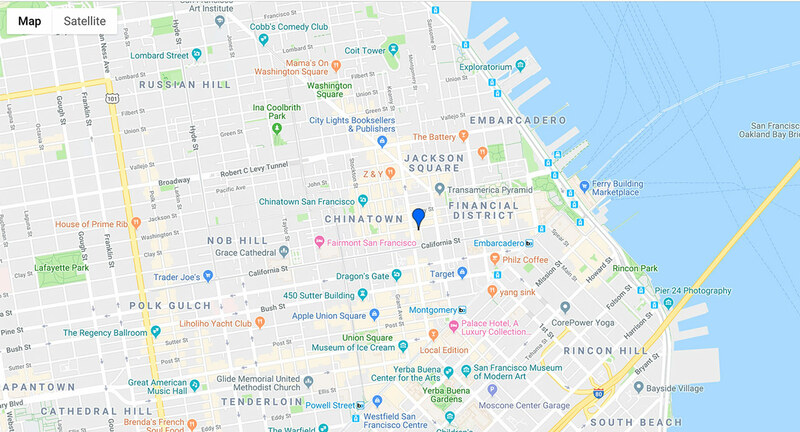 Depending on which bus you are on, there are a couple of stations to choose from when you arrive in San Francisco. Most guests get off the Amtrak Thruway Bus at the San Francisco Ferry Terminal. We'd recommend leaving your car behind, as it's very difficult to park here in the city. However, if you're really set on coming by car, you'll find the directions here. And if you need help parking, we can direct you to some parking garages nearby - though most of these will cost you! There are two parking garages each one block away. One is Portsmouth Garage, across from the Hilton and under the park (Kearny & Clay St). One is St. Mary’s garage, one block south (Kearny & California). Both are around $28/24 hours, but can vary in price. No in/out privileges. San Francisco residents have stickers on their cars that indicate that they are a resident of the neighborhood and therefore are allowed to park there. All other cars can only park for a maximum of 2 hours (usually).